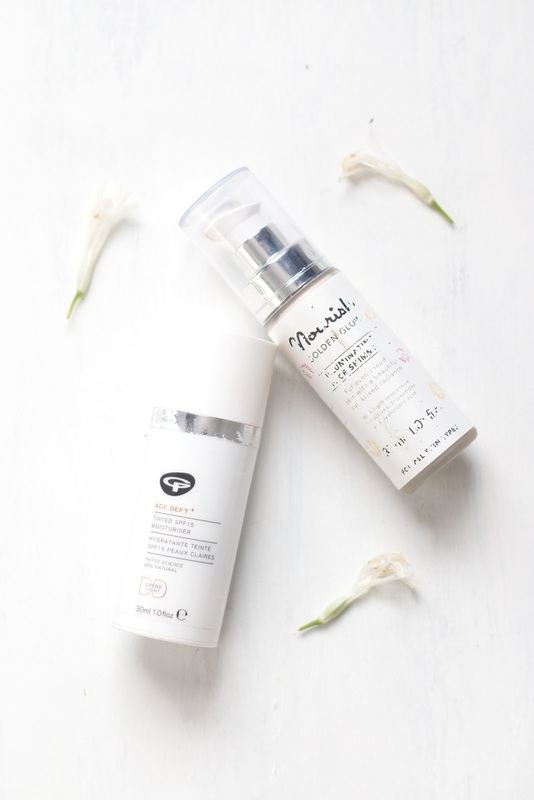 Please excuse the bashed up appearance of both these bottles, it appears travel has taken its toll on the packaging however these are two of my most-loved products and it was only a matter of time before they began to look ‘well used’! So organic makeup; I must admit I’ve not tried a lot but as Organic Beauty Week has progressed (plus some flicking back through posts from the Natural & Organic Product Show) I’ve got my eye on a few pieces to try, but today the spotlight is on these two beauties – the Green People Age Defy+ DD Cream* and Nourish Illuminating Skin Shimmer*. If there’s ever been two products to brighten and reinvigorate my skin instantly, it’s these two – the Nourish Skin Shimmer immediately perks up your complexion thanks to it’s golden pigments, plus it works to even out the warmth of your complexion due to the Active Tonka Bean incorporated in the ingredients. I’ve happily gone to events and into town wearing just this during the summer and it really makes you appear alive, radiant and healthy without spending ages on application or compromising ingredients. For something with more coverage and added SPF, then the Green People Age Defy+ DD Cream is the way to go – the addition of Sea Fennel cells helps to actively firm, brighten and renew the skin which is great when you get acne breakouts and want your base to work with you in healing the skin quickly. As this is a DD cream, it also has properties to even out your skintone so it’s great under your foundation as a ‘perfecter’ or on it’s own for a more ‘I’ve been away sunning myself and look all healthy and glowing’ impact. The lightest shade is still quite dark, but if you’re somewhat pale like me (I’m NC15 in MAC) then it just makes you look a bit more bronzed which isn’t too bad, but it’s something to consider. Nonetheless, this is great under any foundation so it’s easy to blend with other formulas to lighten it (see it in action in my latest tutorial here), and just like Nourish it’s easy to work into the skin using your fingers and wear for all occasions without feeling like there’s anything on your skin – no makeup makeup, sorted. Have you tried natural makeup before? Will you be picking up either of these products? Do you have a much-loved very worn beauty item? #OrganicBeauty Week is from 14th-20th September as part of #OrganicSeptember, learn more about #Campaign4Clarity here! This post is not sponsored, I just really love organic/natural beauty and support the campaign’s message thoroughly! Vote me as Best Long-Standing Beauty Blog in the #BloggersBlogAwards! Thank you for your support! Next Post ORGANIC BEAUTY WEEK: WHY SHOULD YOU BUY ORGANIC?